"For me, it's finished. I could not speak with you," she said. "It's so nice to be on the golf course, to see the players. I hope that with this terrible accident to improve this kind of safety for the public. 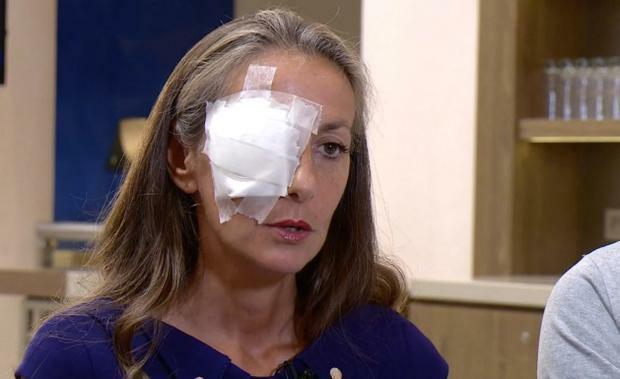 "The doctor said immediately to my husband that it was a very big explosion in my eye and it was impossible for me now to see again with this eye. I don't know how to live with only one eye. I like walking, sport, going to the gym and playing golf." "I wasn't told until I got to the course - I'm not the biggest person on social media - so when I got here and had about seven missed calls and 25 text messages I was like, 'What's going on?'. Then I was told the news and obviously I am really heartbroken. My stomach sank." He added: "It's sad and I really am torn up about it." In Koepka's statement on Twitter, the reigning US Open and US PGA champion said he was "heartbroken" and had been in contact with Remande's family to offer his "heartfelt sympathy". The European Tour has said it will offer her "support for as long as necessary". A Ryder Cup spokesperson added: "Ball strikes are an occasional hazard for spectators, but this kind of incident is extremely rare. We can confirm that 'fore' was shouted several times, but also appreciate how hard it can be to know when and where every ball is struck if you are in the crowd. Europe captain Thomas Bjorn said: "It's terrible, it's a freak accident that's happened, and all our thoughts are with her."